« My Siemens infrared handheld programmer is missing. What do I do? The Trendserver Pro software installation looked normal, but when I tried to import data from a recorder, the import locked up and never recovered. Data would not transfer. In poking around, I discovered that the database folder, TMP5DB wasn’t where it should have been. Where did it go? Apparently, some folders get installed in the ‘virtual store’ folder under the user’s folder, instead of where they really belong. 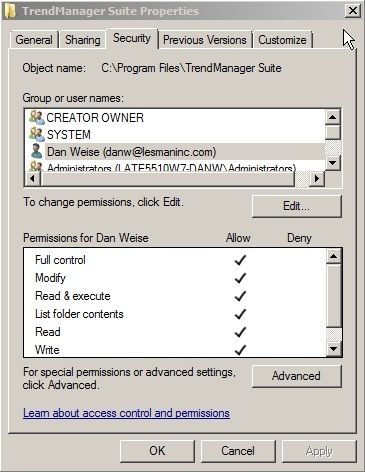 It’s critical that you when you establish security access for any Trendview software program with a database ( TrendServer Pro, or TrendManager), it’s for the folder that contains the Trendview executable program, not for the program’s shortcut. The fix was successful and data now transfers. Check out How to install Honeywell Trendview Suite software in Windows 7 if your Trendview data transfers hang in Vista or Windows 7. Please note, this document is a work in progress. If you find that there’s a step missing, or something that needs clarification, please leave me a comment below, and I’ll pass it along to the team. This entry was posted on September 20, 2011, 9:37 am and is filed under Honeywell, Paperless Recorders, Recorders, Software, Trendview X-Series Paperless Recorders. You can follow any responses to this entry through RSS 2.0. You can leave a response, or trackback from your own site.